Just bought a set of used Ashcroft ATB's. 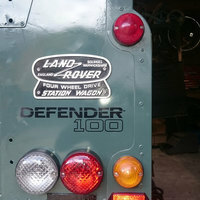 Low mileage but probably used intensily: seller had a Disco Td5 on extreme off road tyres and upgraded to air lockers. The bearings sound a bit grainy and I found some dirt in the splines. Obviously it has seen a bit more than just oil, contrary to what the seller told me. Also found some cracks in what looks like a shim (photo attached). I presume that a dirty halfshaft has been installed - one can also see some rust coloured dirt in the beginning of the splines, in the out-of-focus area. Does anyone have to add something to that? I'm confused as to the photo. An Ashcroft ATB does not have bevel gears. It is a Torsen design with worms gears. The teeth that you see are the splines for the driveshaft. The photo has been taken from the opening where you insert the halfshaft, in the lower right of the image you posted. Edit: your image also shows that the cracked item is most likely one of the belleville washers. Thank you for posting it! Pull it apart. No need to ask for permission. If it not your cup of tea, send it to Nigel. It looks in bad shape and will need parts if it is salvageable. Yes, that took me some time to work out as well! Thanks guys. Think I'll have a go at it next Saturday, dropped a mail to Ashcroft concerning parts. I suddenly saw what you meant with 'illusion'. Freaky! There is quite noticeable spline wear in that photo. It looks like they have been well used. Whether that has any significant bearing on their serviceability I don't know, but it will increase cumulative backlash. I can see the illusion of it being a bevel gear, too. I'd be interested in Nige's opinion about their condition, and more photos of what you find as you open them would help in that. I agree. Those splines do look well past their best. Nothing to lose by opening it up and seeing just how bad (or hopefully not) the rest of it is. Cheers all. I mailed Dave Ashcroft, asking if he could estimate their condition based on the photo, but apart from the fact that the springs are obviously cracked, he can't say anything. I'll ask the seller first if he's prepared to take them back, if he doesn't I'll open them. Actually I'm quite curious to disassemble the ATB's and see their innards. I found absolutely nothing online about opening Ashcroft ATB's (which might be a testimony to their strength) except for the post I quoted above , but I'm not prepared to invest that much money in what might be scrap just for curiosity's sake. Would Loctite 660 work to overcome the wear on the splines? Great pointer Bowie69, I found the post, with a photo of a disassembled ATB ! Seller agreed to take the ATB's back, so I'll order a new one at Ashcroft shortly. Thanks to all for their valued input! Glad it's sorted to everyone's satisfaction. The seller gave me permission to open the other of the two ATB's to assess its condition and to see if it would be OK. In the end I did return both of them but at least it gave me the chance to see what's inside. I suspect others are keen to see it too, so here are some pics. The large cogs should be switched on the photo. This way they wouldn't fit. This is what you see once it's open. Underneath the cog one can see a broken belleville washer, which should be a bit deeper underneat a smaller cog, I probably made a mistake when I briefly put things back to make the photos. One should see a ring on top of it which is part of a smaller, sliding sprocket-like part that keeps the rings contained. They can be seen at the top of the exploded views. The large cog that receives the halfshaft. I now have a new ATB waiting for installation, and when comparing the splines were indeed worn, as Snagger mentioned. The worm wheels sit in the pockets without any bearings or alike. Actually I was surprised about how loosely it all fits. There were also very few unpainted machined surfaces on the inside, also on the outside 'lid' which the worm wheels push against. Here you can clearly see a crack in the spring. Two or three spring washers were broken. Drilling a bit deeper. The middle parts and upper worm wheels are out, and you can just discern the worm wheels of the other side. Have you offered to send these pics to Ashcrofts? I had an issue with one of these once, and it seemed they were genuinely grateful to receive pics of the carnage. They look pretty nasty, but could well be down to contaminated oil rather than any inherent problem. Actually I never thought of sending them the photos, I presumed that they have probably seen any possible way of destruction of their products.